Have a Whopper. On Me. Every so often I have to venture out of my house, off my property and into the big bad city to do something known as grocery shopping. It is a well-documented fact that I hate grocery shopping. I hate shopping unless it involves the comfort of my couch, my computer and Etsy. But the law says since I have three children who follow me around and call me Mommy that I am legally obligated to feed them. Foraging for berries only works at certain times of the year and since I live on the edge of the North Pole, it'll still be weeks before any berries can be foraged. This leaves me in a bit of a bind because unless my children don't mind eating up the spilled remains of dog kibble which have rolled into the corners of the pantry (and they do) I actually need to purchase food items. Kids these days. So damn demanding. I probably wouldn't mind grocery shopping so much if I could do it in my pajamas. My pajamas consist of my birthday suit and a bathrobe. They should institute a day for naked grocery shopping. Just think of the fun of the freezer section! The line was moving slowly and I was growing annoyed. I briefly scanned the other lines to see if they were moving faster but it looked as though everything was at a standstill. So there I stood, waiting. When one waits, one has nothing to do. Except read about Angelina's three-headed baby, which I admit, doesn't terribly interest me. I have four kids, one is invisible, one has super powers and the other two act like they have three heads at all times. So I snoop at what other people are purchasing. Because that is what interests me. And that's when I noticed him. The man in front of me with a grocery cart filled entirely with cases and boxes of Whoppers. Absolutely nothing else but Whoppers. 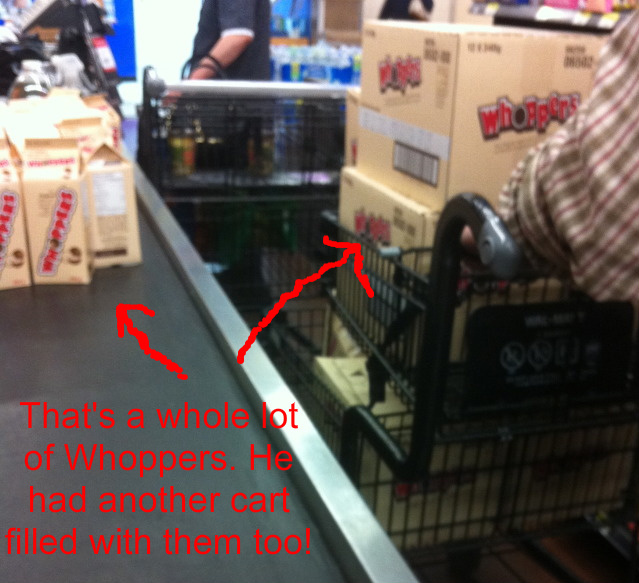 In fact, he had so many Whoppers he needed TWO carts. 15 cases filled with boxes of the candy as well as 20 loose boxes. I know because I listened as the cashier counted them. The total tally for his Whoppers? 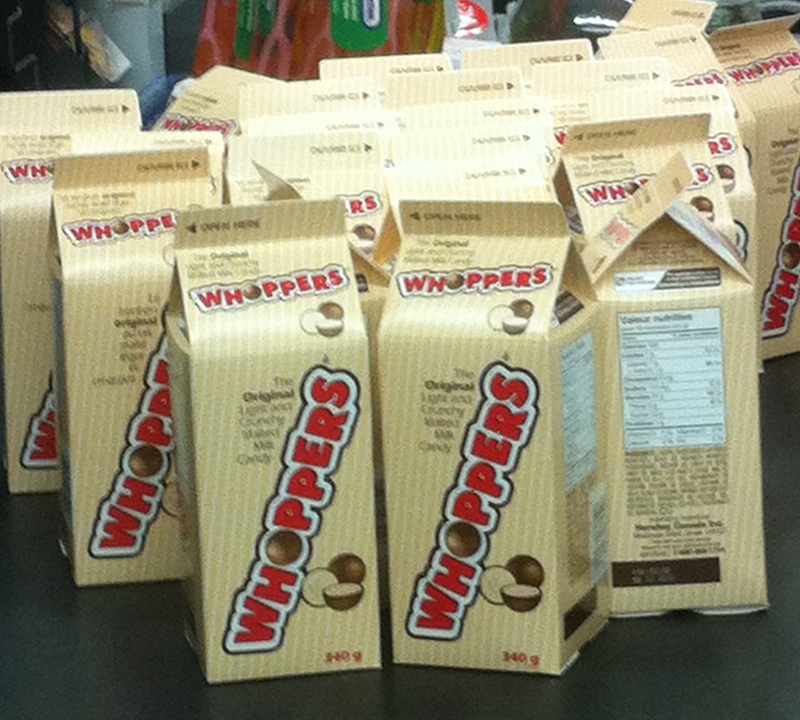 What made the Whoppers so interesting is the man purchasing the candy was quite clearly a Hutterite. Hutterites shun technology and my society in general, so I know he wasn't buying them to resell in his own store. So what does one rural farmer need with over 700 dollars and thousands of Whoppers? Also, I'm totally that girl who is judging you on what's in your cart. Best whopper one liner wins a 100-dollar gift card to Amazon.com supplied by my husband's hard earned cash. Because every one needs a little whopper now and then.